The South African Police Service (SAPS) plans to put into practice its detailed security plan for the 2010 Soccer World Cup during the Confederations Cup in June. 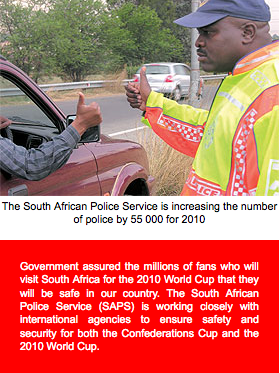 They are spending R640 million on putting into action thousands of officers to ensure a safe World Cup. Through a major recruitment drive, the SAPS is employing many new members to increase general police numbers by 55 000 to more than 190 000 by 2009. The new recruits will be given special training to help them deal with large events like the World Cup. In October last year, the SAPS and the French National Police Force held a joint 2010 crowd control exercise. This was done in preparation for dealing with visitors who will come to South Africa during the tournament. The crowd-control exercise was held at the Pretoria Police Academy. The SAPS also held joint security exercises with the South African National Defence Force and other agencies, as well as government departments last year. The security preparation exercises called "Operation Shield" were held in Port Elizabeth and Bloemfontein. The exercises were aimed at making sure that the South African security agencies had the necessary skills to deal with the major sporting events that are awaiting us. Government's security plan focuses on border security at ports of entry. These include South Africa's land borders, harbours and airports. It also focuses on security along our roads, particularly roads from airports and other borders into the cities. Host cities will be divided into different security sections. There will be teams of police officers patrolling each section. The patrols will focus on FIFA headquarters, hotels, and other places where people will stay. Police will also patrol stadiums, fan parks, restaurants and tourist venues. The security agencies will use modern communication equipment. This includes helicopters, crowd-control equipment, water canons and specially equipped cars to patrol highways. Police will also use 300 mobile cameras. In addition, four mobile command centres will have the latest monitoring equipment. This equipment will be able to receive live images from the aeroplanes and security cameras. There will furthermore be special 2010 police stations close to every stadium. The police will also have special crime-investigation teams and courts. They will look into and deal with all event-related crimes 24 hours a day. A 24-hour multilingual hotline will help visitors who need police assistance or medical services.